President Trump took to Twitter Saturday to praise Steve Bannon's future at Breitbart News, saying his chief strategist -- who left the White House Friday -- will be a "tough and smart new voice" at the site he used to lead. The White House announced Bannon's departure, effective immediately, on Friday, and Bannon returned to Breitbart News, where he was previously the executive chairman, the same day. Breitbart staff welcomed the return of their "populist hero" to the nationalist news site shortly after Bannon told Bloomberg News he will "go to war" for Mr. Trump against his enemies. Mr. Trump took his time making any public remarks about Bannon. The White House confirmed his departure early Friday afternoon, but it wasn't until Saturday morning that the president, who is in New Jersey finishing up a working vacation, said anything about his former chief strategist. Earlier Saturday, Mr. Trump thanked Bannon, noting he joined the campaign during the president's run "against Crooked Hillary Clinton." But some would say that's an understatement of Bannon's role in propelling Mr. Trump to the presidency. The media-savvy Bannon joined the Trump campaign in August 2016, tapping into a nationalist and populist sentiment and harnessing that support behind him. Now that he's back at Breitbart, Bannon appears ready to launch an attack against rivals who go against his nationalist and populist leanings. 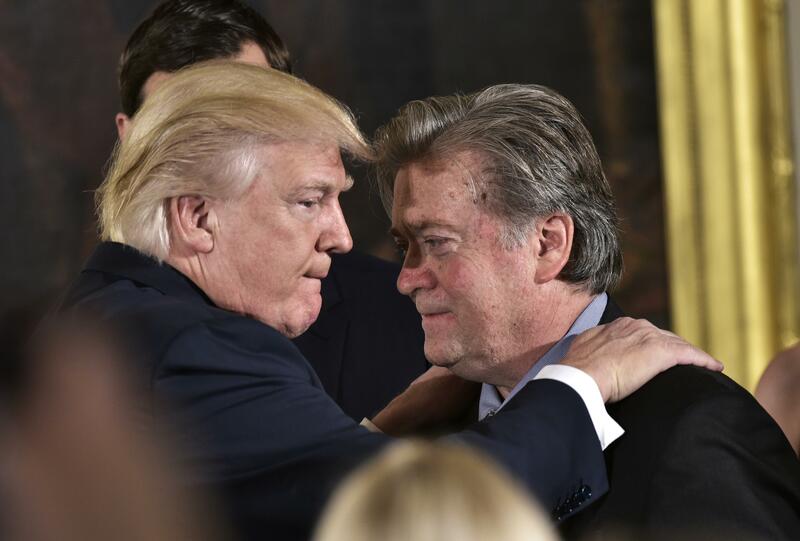 "If there's any confusion out there, let me clear it up: I'm leaving the White House and going to war for Trump against his opponents -- on Capitol Hill, in the media, and in corporate America," Bannon told Bloomberg News. But Breitbart, which has long published pieces favorable towards the president, has shown signs its support has its limits. "Trump's attack on Sessions over Clinton prosecution highlights his own 'weak' stance," one headline from July read, after Mr. Trump launched a social media attack against his attorney general for failing to pursue charges against Clinton even though Mr. Trump himself had backed down from prosecuting Clinton. Sessions is tough on key issues to Trump voters and Breitbart readers, particularly illegal immigration. Last week, in the fallout from the violent events in Charlottesville, Virginia, Mr. Trump stopped short of expressing support for his chief strategist, fueling speculation that perhaps the president had lost confidence in Bannon. "Well, we'll see… Look, look, I like Mr. Bannon," Mr. Trump said at a press conference at Trump Tower last week. "He is a friend of mine. Mr. Bannon came on very late. You know that. I went through 17 senators, governors and I won all the primaries. Mr. Bannon came on very much later than that. And I like him. He is a good man. He is not a racist. I can tell you that. He is a good person. He actually gets a very unfair press in that regard. We'll see what happens with Mr. Bannon. He is a good person and I think the press treats him frankly very unfairly."